My favourite speaker the Design Indaba Conference this year has to have been Alejandro Aravena. He asked, why does low-cost housing depreciate in value and how can these kind of houses be built, 1. within the budget provided by the government, to 2. be an asset to the home owners and 3. help them better their living standards? This is a problem that is very real in South Africa and RDP houses as we call them, are like match boxes in a bigger match box piece of land. It also never takes long for this piece of land to be rented out and built on and before you know it, there is no space, just extended shack rooms with 7 families living there. I was desperate to find out how he solved this very difficult and real problem. He asked why build a half-good house? Rather, quite literally, build a good half house. His logic is that this way they can build on to half a good house as they can afford to. He took the money given by the government and invested a large portion of it into the land becuase position is important to those who have to use public transport. He then took the remaining money and put it into the structure of the building as opposed to the finishes. When the tenants were asked if they would prefer a bath, shower or hot water they all choose a bath. They have never had hot water so that was not a necessity and in a bath they can do their washing, wash the children and use it for a variety of other things. The insides of these homes were barren. Really, the bare necessities. The other really amazing feature about these homes is that they were built with a ‘temporary wall’. This allowed the home owner to build onto the house when they could, without damage to the existing structure. It was an amazing project that completely blew me away. The creative thinking was so complex and the outcome so simple it was in every way what I would call awesome design. I hope some Alejandro homes get built in South Africa. 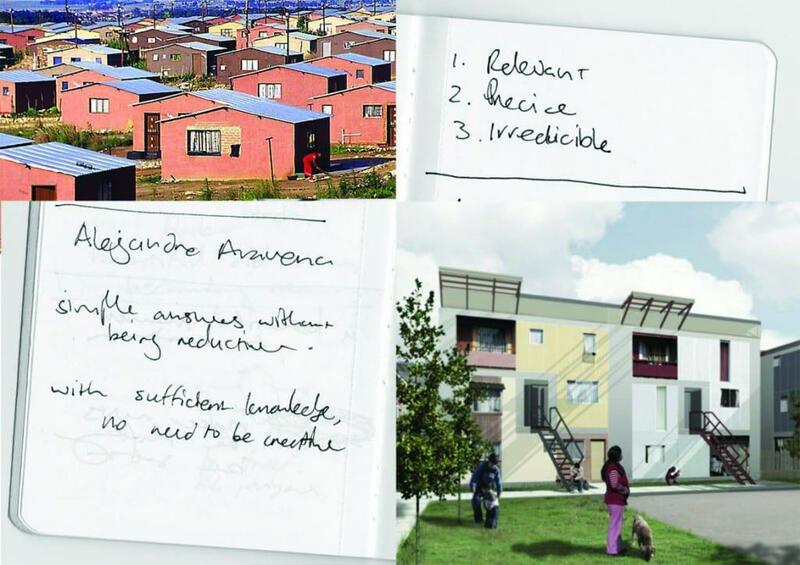 This entry was posted in Blog and tagged 2010, Alejandro Aravena, architecture, creative thinking, Design Indaba, half a good home, half a good house, housing problem, RDP homes, social building design trend, Social Housing problem, South Africa rural areas. Great post,Wendren!Really good project of Alejandro.I like the design of the colourful houses.